By buying this product you'll earn up to 1700 Rewards points. If you're into football analogies, you might say the MartinLogan Dynamo 1600X is like a great lineman: it's big, it hits hard, and it keeps it clean. This flagship model in the Dynamo Series brings the bass with a high-excursion 15" woofer powered by a muscular 900-watt amplifier. And it has some cool app-based conveniences that make it easier than ever to set up and adjust. Download the free ARC Mobile app to your iOS® or Android™ phone or tablet. Your device takes bass measurements using its built-in microphone, analyzes the signal to find acoustic irregularities, and automatically applies correction. The result? 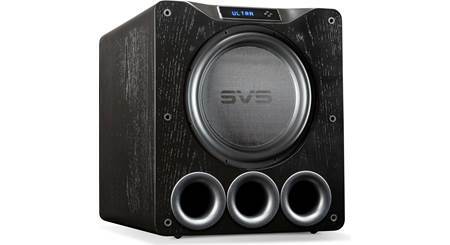 Smooth, well-balanced bass that's tailored to your specific room, furnishings, and audio system. Once you get the Dynamo 1600X placed in your room, you're not likely to have to strain to reach its back-panel controls — it actually has relatively few of those. Instead, you'll use MartinLogan's Subwoofer Control app, which connects the sub to your phone via Bluetooth, so you can make any necessary adjustments from the comfort of your favorite listening seat. That includes volume and preset EQ curves, as well as tweakier adjustments like phase and crossover. The Dynamo 1600X comes set up from the factory with its woofer facing downward. But if you're installing it in an enclosed cabinet you might want to make that woofer face forward instead. 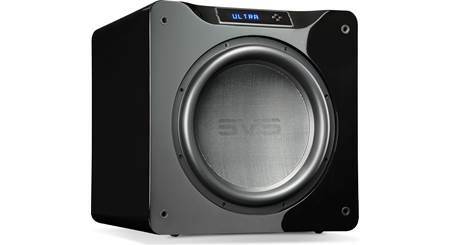 The sub's clever design lets you easily switch the placement of its isolation feet to make the woofer front-firing. It even comes with a grille to cover the woofer in this configuration. If you're placing the sub on thick carpeting, you can remove the rubber feet to expose built-in ETC™ (Energy Transfer Coupler) spikes, which help stabilize the sub and give you potentially tighter-sounding bass. Want to make it wireless? Powerful, High-Excursion Woofer: The MartinLogan Dynamo 1600X powered subwoofer features and advanced-design 15" polypropylene cone woofer with an inverted rubber surround and stamped steel basket, along with a powerful magnet, motor, and suspension design. This advanced-technology woofer pairs a high-power magnet structure with a low-mass diaphragm to provide massive excursion while perfectly preserving the tiniest bass detail. The exceptional damping properties of the cone ensure a smooth, non-resonant response necessary for truly seamless blending with high-performance loudspeakers. Every element of Dynamo 1600X powered subwoofer has been meticulously designed to deliver an outstanding low-frequency performance without a hint of distortion. 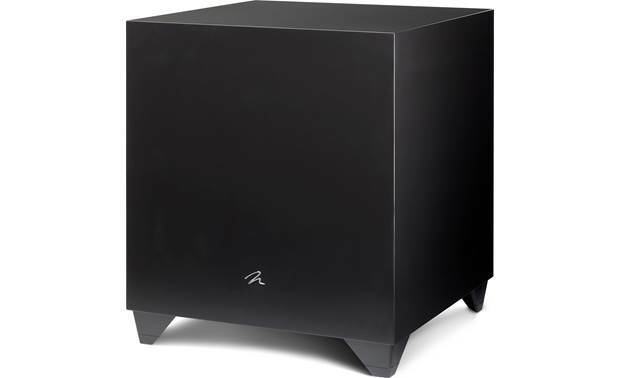 Class D Amplifier Technology: The Dynamo 1600X powered subwoofer's class-D amplifier is rated at 900 watts (RMS)/1800 watts (Peak), operates with extremely low levels of distortion, and delivers dynamic impact with plenty of overhead. Low- noise, high-power switching power supplies produce clean power efficiently in a small space and effortlessly provide tremendous levels of current. Both feature high-quality MOSFET transistors, transformers, noise-suppression networks, and control circuitry. The switching power supply combined with reliable class-D technology means there's virtually no energy lost in the subwoofer system. Acoustically Inert Sealed Enclosure: The Dynamo 1600X features a compact, sealed (acoustic suspension) enclosure that minimizes transient-blurring group delay while maintaining smooth, consistent response, regardless of music or movie source material. The cabinet is constructed from the finest composite material for acoustic integrity. 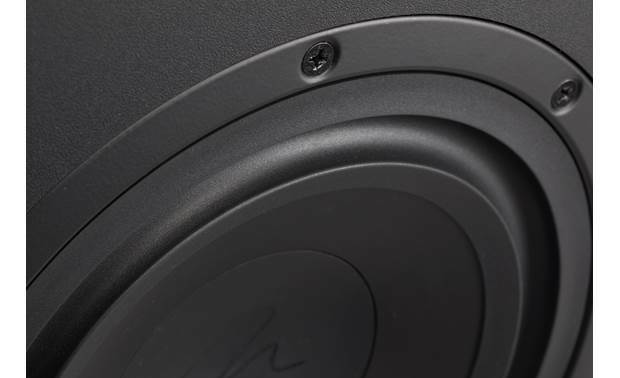 Inside, critically placed structural cross-bracing provides a stable foundation for the woofer, while the added rigidity keeps cabinet-induced resonances and non-linearities to inaudible levels. Inverse Mathematical Equalization (IME) Filter: The IME filter used in the Dynamo series powered subwoofers is derived from the inverse of the unfiltered driver response. Precision IME filtering yields extremely accurate low-frequency response; superior to that provided by the simple second-order high-Q filters typically found in subwoofers in this price range. Volume Level Control: The volume level control (min-max) on the powered subwoofer can be dialed in to match the output level of your loudspeakers. All other controls (such as the Low Pass Filter, Phase/Polarity, Listening Modes, and more) are handled through the MartinLogan Subwoofer Control app for Apple iOS and Android (see below). The volume level control can also be done from the app (there is a switch on the subwoofer to select between using the volume level dial or the mobile app). MartinLogan Subwoofer Control App: MartinLogan's Subwoofer Control app (for Apple iOS 9.2+ and Android OS 5.0+) uses a Bluetooth connection to simplify setup and configuration of the Dynamo 1600XX from your compatible smartphone or tablet device. App based controls include volume level, low-pass filter (frequency and order), phase, 20-30Hz level, three preset listening modes, and control of Anthem Room Correction. A unique tone sweep feature assists users in locating areas in listening rooms where troublesome rattles or resonances may occur. Low Pass Filter: The Low Pass Filter screen lets you to adjust the low-pass frequency for the left and right (RCA or speaker level) inputs and select between a third or fourth order crossover. This setting is not applied to the LFE input, instead leaving the task of bass management to your audio/video processor. If you're using this subwoofer as a dedicated LFE channel, just set the Low Pass Filter to "Bypass". 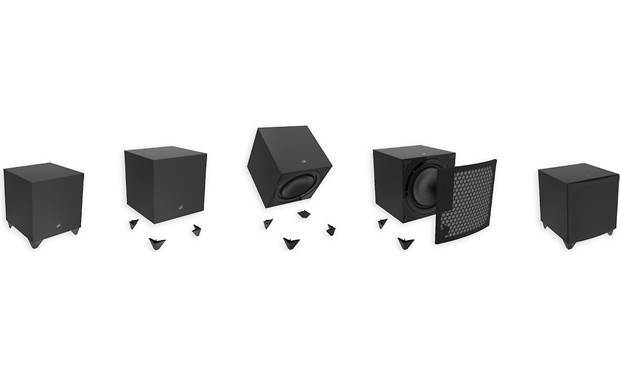 Phase/Polarity: The Phase/Polarity screen allows you to adjust the phase of the subwoofer from 0-180° in increments of 1° and also allows you to invert the polarity of the phase. Listening Modes: Listening Modes let you apply preset listening modes to the subwoofer output. The Movie listening mode is an aggressive setting that maximizes device output for an especially explosive experience. The Music listening mode is balanced for an accurate musical presentation. The Night listening mode reduces bass output for discrete playback. 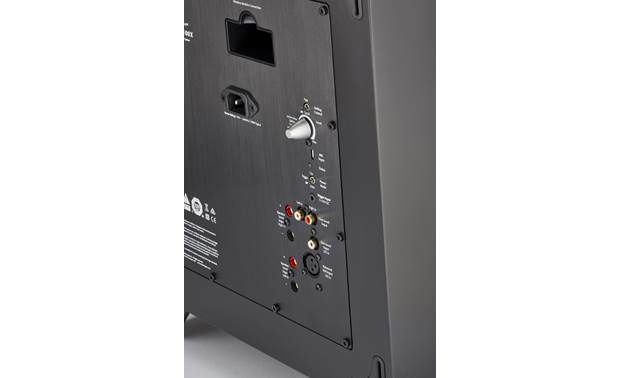 20-30Hz Level: The 20-30Hz Level control allows you to adjust subwoofer output from -10dB to +10dB in the 20-30Hz range; a range where peaks (room gain) and dips of different amplitudes often develop in listening rooms. This control can also be used to add a little extra bass boost to your system when you feel the need. Anthem Room Correction (ARC) Mobile App: The Dynamo 1600X supports the Anthem Room Correction App (for Apple iOS 9.2+ and Android OS 5.0+) through a Bluetooth connection with your compatible smartphone or tablet device. The Anthem Room Correction app utilizes the microphone in your compatible mobile device and measures low-frequency sound output in a room, and then compares it to optimal response curves that account for spatial anomalies. The advanced algorithms of Anthem Room Correction effectively remove anomalies, leaving only the ideal standard with realistically blended, natural-sounding bass. 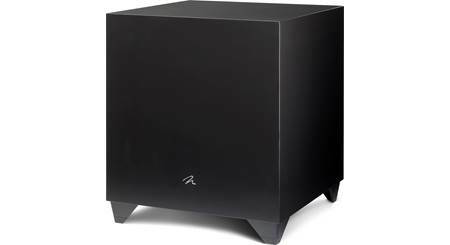 Line-Level & Speaker-Level Inputs: The MartinLogan Dynamo 1600X powered subwoofer features left/right stereo inputs via RCA line-level, a LFE input via RCA and XLR, and speaker-level inputs in the way of banana plugs. Discrete Stereo & LFE Inputs: The Dynamo 1600X's dedicated stereo (RCA) and LFE (RCA/XLR) inputs allow simultaneous connection of both two-channel stereo music and multichannel home theater and allows each source to have individual crossover and level settings, giving listeners a perfect performance in every application. The LFE input uses no low-pass filter, leaving crossover control to your AV receiver. Left and right inputs integrate discrete user-adjustable low-pass filters allowing different level and crossover points when playing back two channel music. Banana Plug Speaker Terminals: The powered sub's speaker-level inputs consist of banana plugs for use with single banana connectors only. The speaker level inputs will not support bare wire connection and do not support dual banana connectors. Optional Wireless Receiver & Transmitter: The Dynamo 1600X includes a USB-A connection port for MartinLogan's optional SWT-X Wireless Receiver & Transmitter (sold separately). The SWT-X Wireless Receiver Transmitter kit incorporates the latest in wireless audio transmission technology - including 2.4GHz dynamic frequency selection, forward error correction, and a range up to 50'. Easy to install, the SWT-X receiver requires no external power source or audio connections at the powered subwoofer (simply plug it into the USB-A port on the the 1600X). 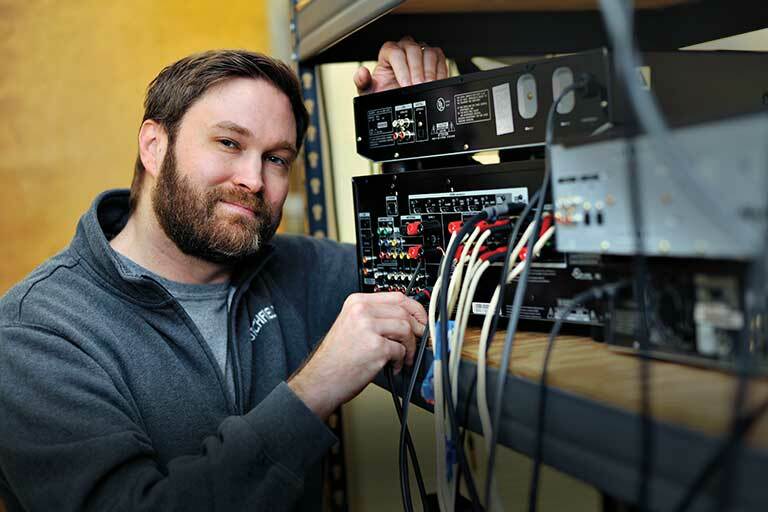 The SWT-X transmitter features RCA jacks which will need to be connected to your AV receiver's subwoofer/LFE output, plus an included external AC power adapter will need to be plugged into an AC wall outlet. Mounting Options: The MartinLogan Dynamo 1600X can be configured as a front or down firing powered subwoofer for different applications. It also comes with rubber & spike feet for different floor types. 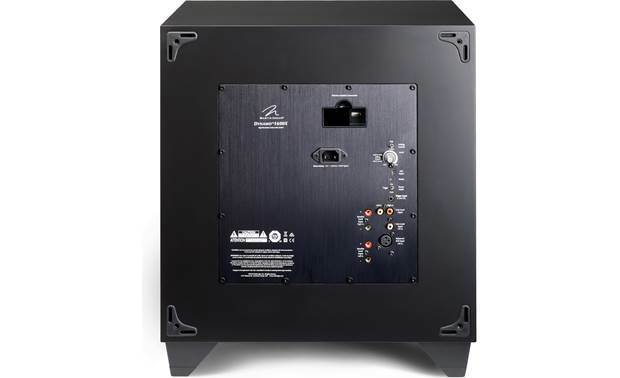 Front or Down Firing: When placed in a cabinet or other discreet location, the Dynamo 1600X powered subwoofer can easily convert from a down-firing to front-firing orientation, with no tools or special skills required. A grille is provided for use in front-firing applications. 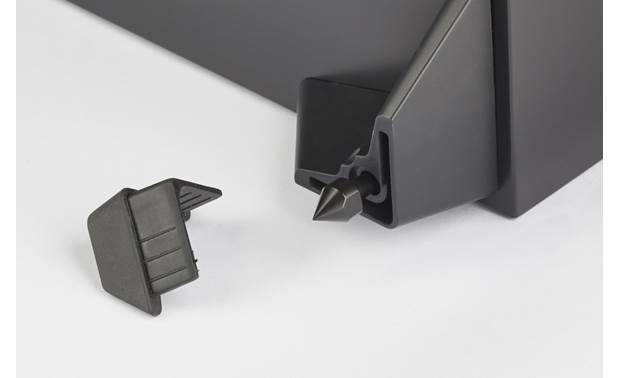 Rubber & Spike Feet: The Dynamo 1600X comes with custom ETC spikes which can be used to enhance stability on thick carpets, or create tighter coupling between the subwoofer and your floor to enhance overall sound quality. The built-in spikes are conveniently and discretely hidden underneath the rubber feet. Dimensions: Here are the Dynamo 1600X's dimensions in a front or down firing configuration and with or without the rubber and spike feet. Auto Power On/Off: The powered subwoofer will automatically enter a power saving mode when no audio signal is detected. 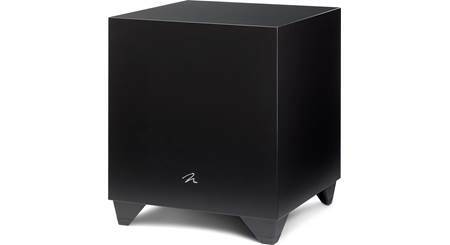 The subwoofer will automatically come out of power saving mode when an audio signal is detected. You can also manually turn the subwoofer On. 12V Trigger Input: The MartinLogan Dynamo 1600X is equipped with a12V Trigger Input (3.5mm; 5-24V DC), allowing an external device (such as your AV receiver) to turn the subwoofer on and off. 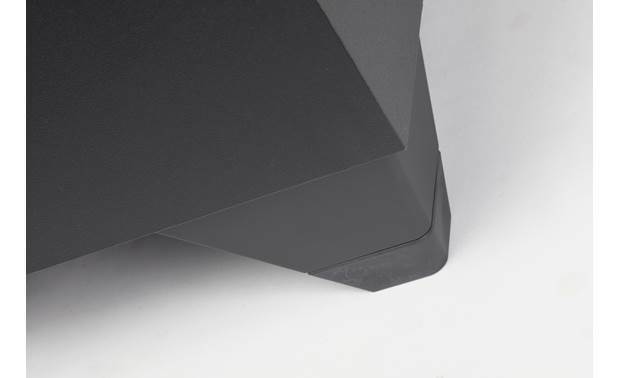 Searches related to the MartinLogan Dynamo™ 1600X Powered subwoofer, wireless adapter optional.